Taylor Canfield won all five of his races Friday to leap into first place and virtually clinch a berth in the semifinals of Stage Two of the 50th Congressional Cup, but he's a hard young guy to satisfy. "We want to win the round-robins and get to pick our opponent for the semis," he said. Four of 18 flights over two round-robins remain Saturday to determine which four sailors will advance to Sunday's sailoffs. And although the 25-year-old pride of the US Virgin Islands as the world's top-ranked match racer would seem a shoo-in - with 11 wins in 14 races - it isn't yet a mathematical certainty. 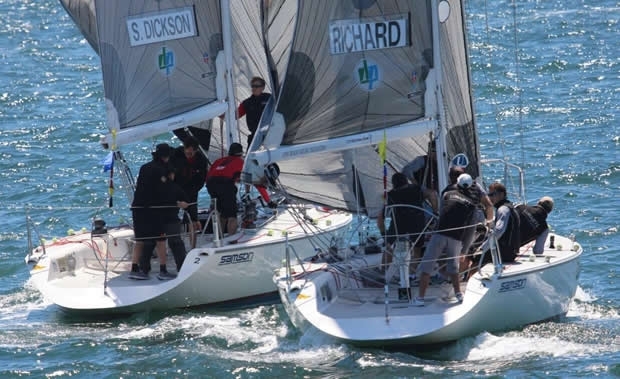 Scott Dickson, Long Beach's transplanted New Zealander who has sailed the Catalina 37s for half his life, won a start against Canfield and led the whole two laps but, with the opponent only two boat lengths behind, couldn't build enough of a lead to execute a penalty turn at the finish - automatic win for Canfield. Ian Williams of the UK, No. 2 in the world, slipped a bit with a 3-2 Friday to stand 10-4 overall, while Francesco Bruni of Italy is at 9-5, with France's Mathieu Richard and Australia's Keith Swinton at 8-6. One of the five must fall, but even 2009 winner Johnie Berntsson of Sweden has an outside chance at 6-8. He has made dramatic comebacks in the past. Richard, the 2007 winner, slipped a bit with losses to Berntsson, Bruni and Dave Perry, but sailed himself back into the picture---and Canfield into a solitary first place - with a win over Williams in the first match of the last flight. With a narrow lead on the outside he took a chance on port tack at the first windward mark by sailing across Williams, who had the inside position for rounding---and just made it. Williams protested, but the on-water umpires waved a green flag - no foul - and as the Brit struggled to get around, Richard sailed away. Richard said later of his opponent: "They're such a good team, we think there should be double points when you beat Williams." The move Richard made to take the lead may be a part of the game plan brought to his team by his coach, Bertrand Pacé, a countryman, and former Congressional Cup and America's Cup competitor who has been working with the team since last year's Monsoon Cup in Asia and will see it through the Alpari World Match Racing Tour this year. "[Richard] came to me," Pacé said. "We're mainly working on tactics and pre-starts. There have been changes in match racing in the last few years. It's a bigger game now with more money." Although always, Pacé said, "the boats are very difficult to sail, especially here when you're leading because the spinnakers are so large." That's why, Pacé said, there is more passing downwind, when a following boat can blanket the leader. That said, Pacé added, "We're very happy to be here." Williams wasn't bothered by the French presence, despite the setback that dropped him from the lead. He'll have another shot Friday at Canfield, who beat him in the first round-robin Thursday. "I feel we're better prepared every day," he said. "We just want to be in the top four." 10. Scott Dickson, U.S., 3-11.